Let an corporation help you with your legal Document. My name is Sophia Alexis Our office is in North Miami Florida I Possess exceptional written and verbal communication skills with 6 years of experience preparing legal documents. 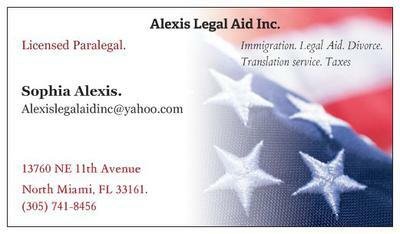 ALEXIS AID INC officially became a Corporation organized under the laws of the state of Florida since May 5, 2017. We are a Legal Document Preparation and litigation expert office we have intensive resources preparing immigration, divorce, bankruptcy, and many other processing. I learned and worked hands-on in the immigration legal documents processing. If you wish to represent yourself in any matter, call me for assistance. I can help with paperwork, Family Law forms, Divorce. Seal or Expunge Criminal Records. Need to file for divorce?